The Budget SLP: Back to School . . .
Today a good friend and former "speech room roommate," told me that she was moving to a new room in her school. I don't envy her. Moving a room and getting ready for school is hard work. Our school custodian knew me well as during my first 12 years as a school SLP, we moved all of my speech stuff seven times. I remember spending many summer vacation weeks setting up my room. Now, "back to school" isn't such a big deal for me as I work much of the summer and my office space stays the same throughout the school year. However, for those of you who are coming back to school this month, below are some resources for "back to school" organizing and other items to help you get ready for your students. Visit the blogs Simply Speech, Heard in Speech, and Speech Room News to read about (and see) their speech rooms. Get Organized! at Sublime Speech. The Speech Ladies posted a DIY Crayon Wreath and there are some good organization tips from Pinterest at The Dynamic Duo's Adventures in Speech & Special Education. Free back to school word wall pictures can be found at abcteach.com and PreKinders. For elementary students and older checkout Education Worlds IceBreaker's Archive where you will find twelve volumes of activities to introduce students to you, their peers, and your routines and procedures. Great activities for beginning of the year inclusion groups. For younger students visit KinderKorner's What's in a Name? page chock full of name games and activities. Friend Bingo, at PreKinders.com, is another great activity for the younger set. For your readers, look at Teaching Heart's FREE, printable, Class Treasure Hunt. Find Scheduling Tips for Elementary School Speech Language Pathologists at The Learning Curve. Downloads from The Speech Ladies include an IEP Chart and Artic Screener. 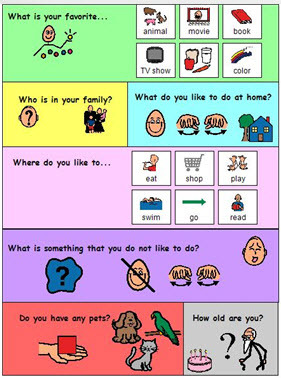 Articulation Trackers and Articulation Therapy Logs can be found at Mommy Speech Therapy. PediaStaff's free TxTools app contains tools for tallies, percentages, finding ages, and scheduling IEPs.